If you do any sort of photography or photo editing, you will need a photo manager to handle all your photos. Linux offers quite a few different photo managers and editors. DigiKam, F-Spot and Shotwell are some of the more popular photo managers in Linux. Though these photo managers all have different positive features, the photo manager I prefer to use is a bit less traditional for Linux. It is Google's Picasa. This tutorial will discuss briefly how I organize my photos and why I use Picasa to do so. One thing I notice a lot is that people are inconsistent with their organization. The best way to organize your photos is by choosing one system and sticking to it. If you use a photo manager to import your photos, make sure you understand what it is doing and where it is putting the files. Also; when I am taking photos in different formats (such as RAW and jpg) I like to separate the two. This way I don't have them showing up as duplicates in the same folder but they will show up in different folders in Picasa. Downloading and installing Picasa is very easy in Linux. Simply download the .deb file from their website and install it. Once you have Picasa up and running, you can specify the folder you want Picasa to view from by going to Tools>Folder Options... As soon as your add photos to the folder you have specified, they will show up in Picasa. As is the case frequently for me when I take photos, I take plenty of bad ones. Photos that are blurry, experiment photos, or just plain terrible. As you are viewing your photos, you can simply press the delete key to get rid of these photos. Often when going through my photos for the first time, I will "Star" my photos that I wish to be deleted. I do this so that if I end up changing my mind, I can simply un-star the photo. Once all the files I want to be deleted are starred, I will use the Select Star option to highlight all these photos, then press the delete key. After I have gone through and weeded out the garbage photos, I like to go through again and Star all the photos I wish to publish, keep or edit. Picasa will allow you to upload to various websites or export files to your hard drive (note: when you export RAW files, it converts the files to jpg before exporting. Your RAW files stay untouched on your hard drive). Even though there are many options for photo managers in Linux, Picasa is my favorite; there are many different reasons for this but ONE MAIN REASON: Picasa does NOT edit or change any of the files on my hard drive. If I do any editing; rotating, cropping, color enhancing etc, rather than changing the files, it simple writes the changes being made to a text file (Picasa.ini). A. I never have to worry about destroying my original photos. B. 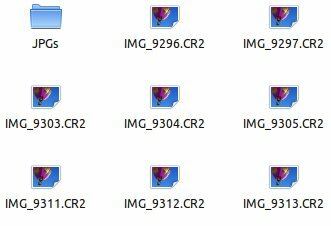 When I open Picasa in Windows, it can read from the same .ini file and show all the changes I made without there being any actual changes in the photo. This is huge for me. I reformat, and repartition my hard drive frequently to reinstall my OS. When I do this, all changes are not lost but saved with the images in the Picasa.ini file. I have used other photo managers before and they either edit my jpg files, or they save the changes to a MySQL database that gets wiped out when I reinstall my OS. Not with Picasa. Fast and Easy. I love me DigiKam for KDE, but I usually experience slow speeds and frequent crashes. Picasa loads fast and is super easy to use. Simple and smart organization. Shows photos by date. Easy editing. While it does not have the most features, Picasa does have enough editing features for most basic photo adjustments. Easy exporting and uploads of photos. Basic and simple photo effects. There are many more great features than what I just listed! I should mention that Picasa was not designed to work in Linux. It was made for Windows. With this being the case, there are some things that will work better in Windows than in Linux, but for the most part Picasa runs very smoothly. Even if you choose not to use Picasa for photo editing, you really should consider organizing your photos and using some sort of photo management system. Do you use something different? Write a comment below and say why! It has been a while since I have used another photo manager and assume they are all getting better; I would love to hear why you do (or don't) like a certain photo management program. Excellent points about what Picasa does differently, it's speed, and it being cross platform, nearly transparently. I do not like that Picasa immediately starts examining my entire home directory rather than letting me choose those I want, i.e. ~/Pictures I don't need to see copies I have made for my web site. I had to clean my server of Picasa.ini files. Picasa also scrawled ini files on my attached backup disc. Now that I have tidied them up in my home, rsync will remove them from the backup. I know it is possible to remove directories later, but that is too much work that should be unnecessary.